An animated representative of what goes on when this trope's in play. A method of recording voices where all (or most) of the actors are in the same room and record their dialogue together. In anime, this is the standard. The animation is typically completed before the voice work is done, with all the actors in the studio at once. This cuts down on production time, and also has the benefit of allowing actors to play off each other's performances as well as see how the actual character looks while the dialogue is spoken. Western animation likewise has this as the preferred style, but whether this can actually be regularly accomplished varies from project to project. In Western productions, the animation work is traditionally done after all the voice work (this technique is known as "pre-lay"), and the animators' job is to match the actor's performance. This can lead to higher animation quality, but is part of the reason why the average production period of these cartoons is up to five times longer than their Japanese counterpartsnote nine to eleven months per episode as opposed to two or less. With voice acting coming into play much earlier in the production cycle, there is less flexibility for when recording can take place. Add in that the voiceover industry in North America is a combination of professional full-time VAs and other types of actors doing voice acting on the side, with the cast for one show/film potentially being scattered across the continent, and you'll find that performers cannot always be gathered together for single group recording sessions because of scheduling conflicts. Voices In One Room notably does NOT occur with dubs of foreign material, except in rare circumstances. This is because Automated Dialogue Replacement (ADR or "post-sync"), the standard dubbing method, is technically very complicated; having multiple actors in a room for ADR would make the process take far longer than just recording one actor at a time. Plus, given the insanely low profit margin for dubbed material, it is necessary to do the work as quickly as possible. The lack of this trope, however, is one of the main complaints of those who find ADR to sound "wooden". As mentioned above, this is standard for ALL anime recording in Japan. However, Japan uses a different style of recording than many other countries. Anime uses what is known as "three microphone" or the "step-up mic", where there are three microphones set in front of a screen showing the cartoon. The actors go through the episode scene by scene and "step-up" to the microphone when it's time for their lines. This technique has its roots in pre-WWII American radio shows. The pictured example comes from the Kirby: Right Back at Ya! episode "Cartoon Buffoon," which parodied how anime gets made. 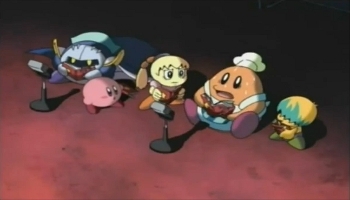 The image in question comes in a scene near the end of the episode, where a bunch of the cast get into one room with and try to voice a crudely drawn anime casting Dedede as the hero, which leads to people shoving each other out of the way to voice their lines while other people in the same room talk about how dumb the writing is. The staff of Code Geass made a comic detailing the process, discussing the actors' (represented by their respective characters) particular quirks, like Takahiro Sakurai wearing a beret to get "psyched up" for his reads and the male actors teasing Ami Koshimizu about how thin her thighs are. This was averted in the Cloverway English dub of Sailor Moon. Incidentally, Sara Lafleur and Barbera Radeki (who played "Amara" and "Michelle", respectively, partners in a bowdlerized relationship), always recorded together. A rare English dub example occurs in the 1996 recording of the Oh My Goddess! OAV. In two separate scenes, the actors for Keiichi and Belldandy recorded together. The director did this for a couple of reasons: 1) the script called for the characters to talk over each other and he didn't have the technology to do it in post; 2) the actors were engaged at the time and he wanted to take advantage of their obvious chemistry. Some of Disney's English dubs of Studio Ghibli films will do this. In their dub of My Neighbor Totoro, Dakota and Elle Fanning recorded together. And in Whisper of the Heart, Brittany Snow (Shizuku) and Ashley Tisdale (Yuko) recorded their song together. In Summer Wars, the voice actors recorded together in both the original Japanese version and the English dub. A Cutaway Gag in Haiyore! Nyarko-san shows Nyarko and Mahiro as Animated Actors performing in this fashion (and Mahiro throwing his copy of the script at Nyarko's head as punishment for her repeatedly invoking Ending Tropes). Being an anime about making anime, Shirobako demonstrates how it's done in several episodes, including variations like a large group doing background voices for a crowd. Being a series about anime voice actors, Sore ga Seiyuu! has this a lot. Episode 1 involves a traditional anime voice acting, while in episode 7, Futaba tries her hand on dubbing a foreign movie—apparently ADR is not necessarily used in Japanese dubbing of foreign films. Animated films in America are often NOT recorded with all voices in the same room due to Hollywood's increasing tendency of relying on popular film stars to fill major voice roles. Due to these actors' schedules, they usually record separately from the minor actors (usually full-time VAs who often DO record together). But even then there can be aversions, as listed below. In Shrek 2, John Cleese and Julie Andrews recorded together. This might have to do with the fact that they're both trained in the English style and could have had difficulty acting alone. When they did The Road to El Dorado, Kenneth Branagh and Kevin Kline asked to perform their dialogue together. The result was a very natural (and very funny) banter. This trope and Improv are how the CGI animated film Surf's Up was recorded. John Goodman and Billy Crystal recorded most of their dialogue together on Monsters, Inc..
TMNT had all the turtles voice actors record together. It helps that they're voiced by veteran voice actors, and thus would be able to do so. Wreck-It Ralph may have been subjected to this trope to allow for natural sounding Improv from the leads. When recording dialogue for the emotional scenes in Frozen, Kristen Bell and Idina Menzel recorded their lines as Anna and Elsa respectively in the same room. Examples include "For the First Time in Forever (Reprise)" and much of the scene when Anna is in Elsa's ice castle. Some of the Shark Tale voice actors recorded their lines via this trope, such as Will Smith and Jack Black, and Robert De Niro and Martin Scorsese. Beauty and the Beast did this for at least Paige O'Hara and Robby Benson, who voiced the eponymous couple. Likewise, Jerry Orbach, David Ogden Stiers, and Angela Lansbury, who voiced, respectively, Lumiere, Cogsworth, and Mrs. Potts, also recorded their dialogue together as well. An early example was All Dogs Go to Heaven, which had Burt Reynolds and Dom De Luise recording all their dialogue as Charlie and Itchy, and Vic Tayback and Charles Nelson Reilly did the same as Carface and Killer. In both cases, they improvised a great deal of their dialogue. The former two would even send director Don Bluth out of the room to properly cut loose. Jack Black and Angelina Jolie recorded together as Po and Tigress for Kung Fu Panda 3, and may have done the same for the other two movies. Bill Hader and Anna Faris recorded much of their dialogue together for Cloudy with a Chance of Meatballs. Nathan Lane and Ernie Sabella recorded all their dialgoue for Timon and Pumbaa in The Lion King together because they had such great chemistry. It helps that the two were close friends and thus could easily work with each other. Just like in the main series, My Little Pony: The Movie (2017) plays with this by having the usual Vancouver actors record together. Tara Strong and the celebrity actors record in separate studios in Los Angeles and New York. For The Boxtrolls, Dee Bradley Baker and Steve Blum, who voiced many of the titular characters, recorded together. Although he's a London based actor, Matt Ryan actually went to Los Angeles to reprise the role of John Constantine for Justice League Dark . That's dedication. For the making of Rango, the actors not only recorded many scenes in the same room but often acted them out with cameras capturing their movements to use as a guide for the animation. Teen Titans Go! To the Movies has the voice actors for the Titans record together, just like in its parent series. Ratchet & Clank (2016) had James Arnold Taylor and David Kaye, who voiced the titular duo, record their dialogue together alongside Jim Ward (Captain Quark) and Armin Shimmerman (Dr. Nefarious). This is The BBC's preferred method for producing radio drama, although the "room" is sometimes replaced by a location, as with the 1990s production of Bleak House, recorded at a castle in Kent. This is also Big Finish's preferred method producing Big Finish Doctor Who and their other series. Apparently Tom Baker doesn't do this, though the producers have kept quiet about whether it's because of his advanced age, or because of his relationship with some of his old co-stars. The English version of Snatcher had actors that recorded with each other. This combined with the use of actual professional voice actors made for a result way better than what most games had at the time. While most of the voice actors in the English dub of Kid Icarus: Uprising recorded their lines separately, Pit and Palutena's voice actors, Antony Del Rio and Ali Hillis respectively, recorded many of their lines together. For Batman: Arkham City, the scenes where Batman and the Joker interact were recorded with Kevin Conroy and Mark Hamill in the room together. Most of the dialogue in Life Is Strange was recorded separately by each actor, but the more emotional scenes between Max and Chloe or Max and Kate were recorded together. Sailor Moon Abridged, uniquely for Abridged Series, is recorded with all the players in one room. It becomes obvious in the outtakes when things get changed at the last minute, lots of Throw It In! and one of the actors being forced to leave the room because he couldn't stop laughing and ruining the take.note For reference, the standard recording style for abridged series is either one guy Talking to Himself, or an editor taking snippets of dialogue from voice actors that may be on opposite sides of the planet from each other and editing it all together to make an episode. According to Instagram posts, The Grossery Gang webseries utilizes this, as, thanks to the backing of the toy franchise, it has a higher production value, so it has higher voice actor use. The Most Popular Girls in School cast does this. Like with Japan, this is standard for many Western animated TV shows, except that in America, 90% of the dialogue is laid down before a single frame is ever animated (hence the term "pre-lay"). It would be far easier to list instances where this style is partially or entirely averted. This is the standard procedure for any show in the DCAU, and appears to be voice director Andrea Romano's preferred style. At times Mark Hamill would just accidentally mess up the session by making everyone laugh while doing the Joker voice. How? Because he didn't sit down and read the lines, he actually stood up and performed the actions. At times, the artists would then base Joker's movements during lines directly off of what Hamill was doing. The reason this worked is because this is the guy who played Luke Skywalker, who can overact like no other ("NOOOOOOOOOOOOOOOOO!!!! IT'S NOT POSSIBLE!!!!!!!!! "), which fit the Joker. In one famous example, the episode "The Man Who Killed Batman" has Joker conduct a "funeral" for Bats, complete with Harley playing "Amazing Freaking Grace"... on the kazoo. They could only do this in one take because Arleen Sorkin actually did play "Amazing Grace" on a kazoo and afterwards everyone was laughing too hard to continue. In an interview for Batman: Arkham Asylum, Kevin Conroy (the voice of Batman) mentions that this is how most of the WB's animated shows are produced. By comparison, trying to give a comparable performance alone in a recording booth is much harder. Archer is a modern aversion of this in western animation. Voices are recorded in isolation and edited together through heavy use of Two Scenes, One Dialogue and Conversation Cut. It works surprisingly well, and the ability of the cast to bounce off of each other is frequently praised. For the Sonic SatAM cartoon series, a variation was used: Most of the cast (which was largely composed of veteran full-time voice actors) acted in the same room, with the sole exception of Jaleel White, the voice of Sonic. While this made it hard to play off of the rest of the cast, he also had more takes to work with. This was especially true for Adventures and Underground, because those two shows did their recording in Canada, while Jaleel was in Los Angeles. Matt Groening prefers his shows do this whenever possible. The principal actors on The Simpsons record together, and oftentimes the actors on Futurama will as well. Done in production of Foster's Home for Imaginary Friends, as well as most other shows Craig McCracken is involved with. Also done in The Powerpuff Girls. Tara Strong (voice of Bubbles) has said in interviews that the outtakes from that show were so insane that if they were ever leaked, she and EG Daily (voice of Buttercup) would be in a lot of trouble. Notorious on The Angry Beavers, leading to a general conversational feel to the show, as well as tons and tons of very obvious Throw It In!. Thunder Cats had the cast recording in the same room, leading to some amusing bloopers (with many expletives). The original Transformers cartoon was recorded like this, and according to the voice actors this led to many amusing antics inside the recording studio — Frank Welker and Michael Bell were apparently notorious for encouraging the voice actors to misbehave. Transformers Prime follows a similar method as revealed in behind-the-scenes footage. Recess did this whenever it was possible. My Little Pony: Friendship Is Magic has a partial aversion. Principal voice recording takes place in Vancouver. Unfortunately, Tara Strong (voice of main character Twilight Sparkle) lives in LA. To get around this, the other cast members all record together, with Tabitha St. Germain performing Twilight on a scratch track. Tara then records over the scratch track later. This arrangement was itself averted in the recording of episode 3 ("The Ticket Master") and the season 5 premiere ("The Cutie Map"). Tara went up to Vancouver to record with the rest of the cast. For the season 8 premiere, Maurice LaMarche (who voiced Chancellor Neighsay) was with the voice actors in Vancouver. Many shows produced by Loren Bouchard: Dr. Katz, Professional Therapist, Home Movies, Bob's Burgers. The actors are generally encouraged to improvise. Ninjago does this, as seen here . Subverted with Rugrats. While the cast does record in a group, they usually record in two separate groups - the Rugrats themselves and the adult characters. Tara Strong recorded her lines for Dil separately. As most of his lines are either crying or speaking gibberish, she recorded separately because the "dialogue" she had to record for Dil could get irritating after a while. The Beetlejuice cartoon mostly averted this trope, according to an interview with Stephen Ouimette (the voice of the title character). He and Alyson Court, who voiced Lydia, would record their lines together, just the two of them, and the rest of the cast would be recorded and added afterward. Star Wars: The Clone Wars and Star Wars Rebels, with the occasional exception of voice actors like Lars Mikkelsen (the voice of Thrawn) and Tom Baker (the voice of the Bendu), usually because they're overseas and the recording studio where the voice actors gather is in Lucasfilm Headquarters, located in San Francisco. This is how episodes of SpongeBob SquarePants are recorded - most behind-the-scenes features show the cast recording together. Averted with the movie, as the film involved more celebrities (Alec Baldwin, Scarlett Johansson, etc.) which likely made scheduling more difficult, so behind-the-scenes footage shows them recording their lines alone. Averted with recent Looney Tunes projects - according to Bob Bergen (the current voice of Porky Pig and Tweety Bird), sometimes it can get very confusing when he only gets his lines and has no idea what the context is. A partial subversion for both Sofia the First and Elena of Avalor. According to Craig Gerber, the creator of both shows, the cast members usually record their parts separately, but are usually brought together for the more emotional scenes and if schedules work out. Subverted with Phineas and Ferb. All the actors recorded their lines separately, with a majority of them from Los Angeles, while Maulik Pancholy (voice of Baljeet) recorded his lines from New York, and Thomas Brodie-Sangster (voice of Ferb) recorded by his phone from England. This is also generally averted with the creators' next show Milo Murphy's Law, due to how the lead character is voiced by famous musician "Weird Al" Yankovic, who's naturally busy. Stretch Armstrong and the Flex Fighters also follows this trope, according to Scott Menville (voice of Stretch) and series co-developer Kevin Burke. Vampirina plays with this. Behind the scenes footage does show the cast together. However, Ian James Corlett, voice of Chef Remy Bones, has houses in both California and Canada, meaning he could potentially join the voice actors in one session, and record separately another time. Averted with Ducktales 2017, but it was almost played somewhat straight. The obvious aversions are with David Tennant (Scrooge McDuck) and Catherine Tate (Magica DeSpell) who are based in the UK as opposed to the US like everyone else (and presumably record together). Danny Pudi (Huey) and Ben Schwartz (Duey) initially recorded together, but they distracted each other so much that they ended up recording separately. Star vs. the Forces of Evil, since it has both big names and big voice actors attached to it, would have them record separately. It's done, though, like with the episode "Friendenemies", where Adam MacArthur (Marco) and Rider Strong (Tom) recorded together. Justice League Action has the cast record together, although not always, usually if it's too large a cast (like with Race Against Crime). Young Justice not only has the actors record together for the most part, but the actors perform the kissing scenes between their characters. Several characters in season 2 had their actors replaced because they weren't available for recording sessions (Rocket, The Flash, Deathstroke). They almost had to replace Tim Curry as G. Gordon Godfrey for the same reason, but Greg Weisman stalled by performing a scratch track mimicking Curry's long delivery times as much as possible, and having Curry record later in ADR. The voice cast for Muppet Babies (2018) records their dialogue together. Jenny Slate, the voice of Nanny, is the usual exception. Behind the scenes footage for Avengers, Assemble! also shows this is the case. Hanna-Barbera typically did this for their shows. One notable exception was George O'Hanlon when he returned to the role of George Jetson in the 1980s, this was due to how much longer it took him to record his lines after suffering a stroke. Steven Universe sometimes does this - the episode "Hit the Diamond" was the first time that the entire voice cast for an episode was there at the same time. Since Charlyne Yi (Ruby's voice actress) had to voice not only the main Ruby, but all five members of the Ruby Squad, in that episode, this involved everyone else standing around and watching her talk to herself. In Breadwinners, Robbie Daymond and Eric Bauza record their dialogue for SwaySway and Buhdeuce together. This video for She-Ra and the Princesses of Power shows that the cast records together.